Our agrarian culture of the past chose wedding dates based upon the peak harvest times. If you married in June, a possible summer pregnancy would still be early enough in the season that a wife could assist with manual work during that year’s harvest period. Following the spring birth, the recovered bride would be able assist in the next year’s harvest. At one time in our culture regular bathing was a once-a-year event usually during the last part of May or beginning of June. Scheduling a wedding during June meant the couple would have had their “annual bath” and was probably the most presentable than any other time of the year. Couples schedule their weddings in June to honor Juno, the Roman goddess of marriage. Many believe marrying in June meant their marriage would be showered with luck and good wishes from the gods above. My parents scheduled a June wedding back in 1938; possibly for reason #3. This Wednesday, on June 25, they would have been married seventy-six years. 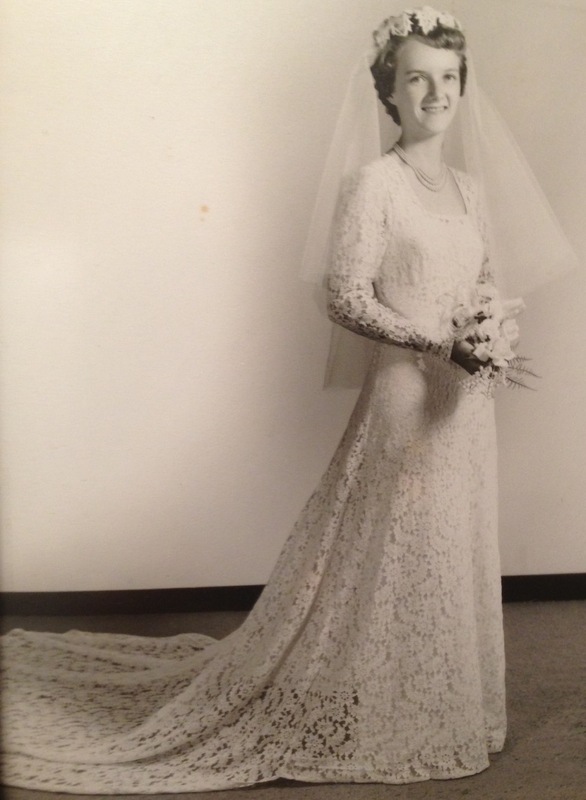 Here’s what my mother looked like on her wedding day. 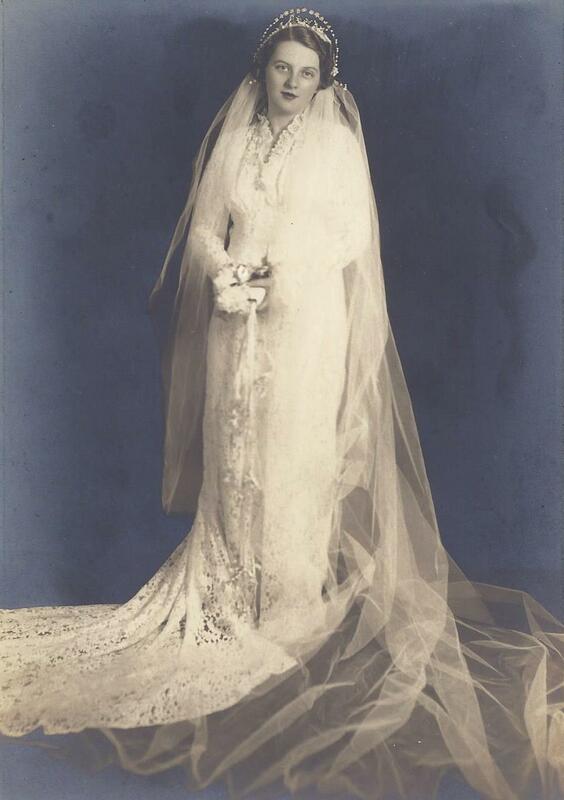 It was (is) a lovely dress made from imported Alençon lace. A wedding dress with a unique story to tell. 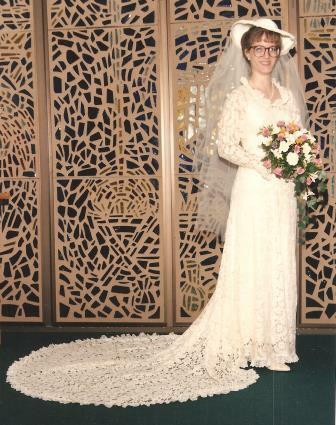 Twenty-five years after my mother and father’s June wedding, I wore the same dress. Young and anxious to start our life together, we chose May 30 for our wedding day. The reason – we’d have an extra day off work. Back then, May 30 was the Memorial Day holiday. We honeymooned near our hometown over the weekend and both returned to classes and our jobs at the University of Texas Library on Monday. Twenty-four years later, our daughter aka Chicken Wrangler Sara wore her grandmother’s dress at her wedding. Sara chose the second most popular month for weddings – August. Three times a firstborn daughter has worn the beautiful hand stitched dress. My mother’s mother stitched the dress for her daughter. Mother was only four feet eleven inches tall so grandmother altered the dress for me to wear, then I altered the dress for my daughter, who was a couple of inches taller than I am. In the twenty plus years between weddings, the dress remained tucked safely in a cedar chest. I still keep it inside the small cedar chest, which was originally my mother’s hope chest. Will a firstborn daughter wear the dress again? Who knows? My daughter’s firstborn daughter will be graduating next year. Maybe we’ll be altering the dress for her someday. If not, the dress will continue to live in the little hope chest. And, probably, one day appear in one of the love stories I write.